Discussion in 'Applications' started by Juumi, Jul 25, 2018. Im a danish,26 year old guy, who have been playing WoW on and off since Wrath. When im not playing WoW, then im working as an accountant. When im not doing either of the above, then i spend time together with my girlfriend. Warcraft Logs: Have not raiding on this char yet. Why are you applying to MM? How did you hear about us? Do you know anyone here? : Im currently in the guild as a social. But im looking to be raiding again going into BFA. Why are you leaving your current guild? If we were to look at your guild history, would we find anything concerning? : See the answer above. What is your main spec? How long have you played this? : Main spec is Frost, but i will play what dps spec has the best output. I made this char for about 6 months ago or so, and have played it almost every day since. What is your stat priority? Explain why. : In my current gear: Haste > Vers = Mastery = Strength = Crit. Running my toon in simcraft. Why should we bring your class/spec to a raid? What do you feel is the defining feature of your class/spec? : Death Knight have some unique utility spells, and the two dps spec have their different uses - Frost is good for burst damage and Unholy is good for constant aoe damage. What addons do you use to enhance your performance? 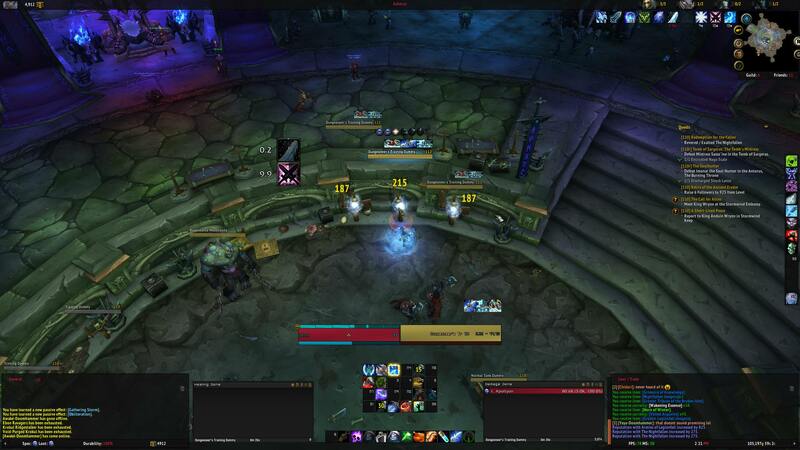 : Weakaura, Exorsus Raid Tools, Big Wigs, TellMeWhen. Where do you find the latest information in relation to your class? : Death Knight Discord is the best place. What do you do outside of a raid to improve your character, play style and performance? : Farming consumables for raid. Farming for gear upgrades and doing M+ to keep me on my toes, so to speak. Do you ever change around talents depending on the encounter? If so please, give an example. : I change around talents, if the encounter needs something to be killed asap, i take the talents that helps with that. What is your offspec? How comfortable would you be if we asked you to raid as your offpsec? : Unholy, i would be fine with playing it. We raid Wednesdays, Thursdays and Sundays 20:00-23:00 Server Time. Are you able to commit to these times and days? Yes. Can you accept criticism? If not then do not apply, we frown upon shifting blame a lot more than people admitting to mistakes and improving on it. Yes. Do you have a mic? Do you have a proper setup and internet connection to play the game competitively? (that is, at least 30 and ideally more fps in raids): Yes. We all need the occasional raiding day off for various reasons, but we expect these reasons so to be fully disclosed at as early a time as possible to make planning an easier process. Have you any planned absences in the foreseeable future that we should know about? No. Do you have anything else to add? : Only that im looking forward to hear from you.